At left is Franz Josef Glacier, and what follows is a posting from the BioLOG by Richmond Appleton. Today, I conquered one of [my] can’t do attitudes by hiking on the Franz Josef Glaciers with eleven members of our group, woo! It was really fun to see glacier for the very first time in my life. But not only did I see it, I walked on it. The history of the glacier is quite intriguing. Julius von Haast, a geologist and explorer, named the glacier Franz Josef Glacier in 1863, after the Emperor of the Austro-Hungarian Empire. Approximately 7000 years old, and a residue of a much older and larger glacier that originally swept right to the sea, Franz Josef Glacier extends 12 kilometers from its three feeder glaciers in the high snow fields of the Alps. Currently, the life-threatening face is about 19 kilometers from the sea and just 5 kilometers from the township. By 1954 the glacier had retreated so that it was no longer visible from the town. The forward moving from melting ice and waterfall from surrounding mountains to the glacier brought it back into public view. From early Maori legends this glacier was called Ka Roimata o Hinehukatere. The Tears of a Maori Girl (Hinehukatere), Hinehukatere loved climbing in the mountains and persuaded her lover, Tawe, to climb with her. Tawe fell from the peaks of the mountains and died. Hinehukatere was broken hearted and her many, many tears froze to form the glacier. The Franz Josef Glaciers run via amazing glacial valleys to flow into a beautiful rainforest. 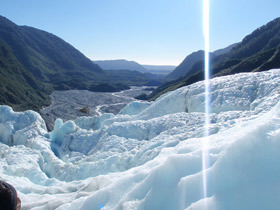 What is unique about Franz Josef Glacier is that unlike any other of the world’s glaciers that retreat, these glaciers still flow almost to sea level, which makes them very exceptional relics of the last Ice Age. Because the glacier lies between huge winds called the roaring forties, the wind rise above the Southern Alps causing cooling and moisture as it rains and snows. Even though the glaciers start to melt from the top at lower altitude, the elevated snowfall constantly pushes ice down the valleys at very fast speed. This creates a barrier sliding, placing deposits of water beneath the glaciers, formed by the weight of the ice pushing against the valley floor. These factors cause the Franz Josef glacier to flow at faster rate up to 10 times faster than most valley glaciers in the world. It was amazing to see how the glaciers flow over large bedrock and overhang everything around it. Sometimes I could hear the ice break up as it forms steep icefalls and sometime creating mullins, tiny holes that turn into tunnels making pathways. This was a unique glacier experience for me to walk on large impressive landscape of ice that I have never dreamed of before. It was really awesome! !